Purchase a $25-day pass and take advantage of the facilities at the InterContinental Hotel on Front Street. The pass gives you access to the hot tub, steam room, towel service, fitness centre, and a 48-foot saltwater pool to enjoy the feeling of swimming in a salty sea without leaving the city. Afterward, kick back on the spa terrace and get comfortable on the padded lounge chairs. The rooftop pool at the Hyatt Regency is open the public Thursday to Sunday with a $39 day pass. 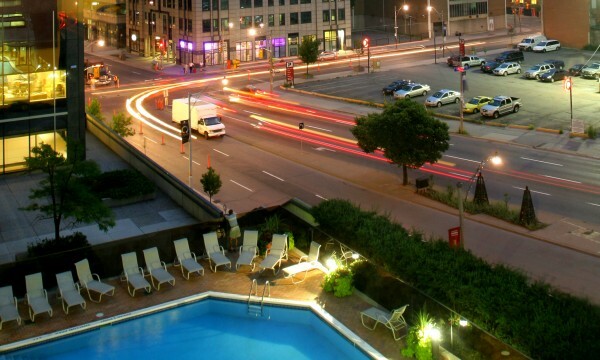 Located in downtown core, visitors of this sun-drenched swimming pool take in an expansive view of the entire city while reclining on the cushioned lounge chairs. You can even order food and drink from the room service menu. As an added bonus, a day pass includes one free drink. At the Radisson on Queen’s Quay, a day pass will set you back $40, but it includes towel service, lockers and showers. Situated on the waterfront, this hotel gives you a breathtaking view of Lake Ontario and the Harbourfront district which is always a bubbling hive of activity in the summertime. 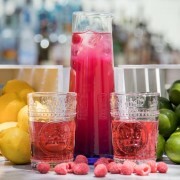 Visitors also enjoy access to the full menu and bar service. Day passes at the Sheraton cost $35, and you can also get a family pass for $80. This hotel’s big claim to fame is that it has Splash@Sheraton, the biggest indoor/outdoor heated pool in Toronto, located on the third floor. Glass walls separate the indoor from the outdoor section, and the pool is open year-round. 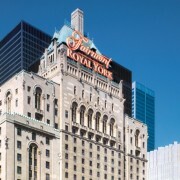 At the opposite end of the price spectrum, we have the Toronto Don Valley Hotel which only charges $10 for a day pass. It has both an outdoor and an indoor pool, bar service, and complimentary wifi access. The indoor pool is circular with a vaulted dome glass ceiling to fill the room with sunlight. The outdoor pool is more of a standard hotel pool with many lounge chairs on deck to work on your tan. 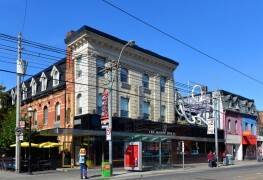 For $35 you can access the saltwater pool and fitness facilities at the Windsor Arms. 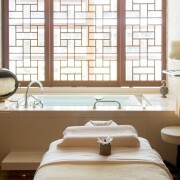 The hotel also offers a full suite of spa services including massages and skin treatments. If you are interested in using any of those services and spend over $100, access to the pool and fitness facilities is included as a bonus. You can also hire a personal trainer for $150 an hour if you need some guidance in getting your beach body ready for the season. Gaining access to the chic Shangri-La Hotel will set you back $200 if you aren’t a hotel guest, or a resident with a unit in the upper floors, but you get a lot of bang for your buck. The spa pass gives you access to the 64-foot pool as well as change rooms, steam rooms, massage therapy sessions, Jacuzzi, infrared sauna and fitness facility. It’s the perfect spa day getaway location if you need to de-stress and treat yourself to something nice. The Four Seasons is practically synonymous with high class luxury. Access to their public pool comes with booking a 30 min message treatment which will cost you $115. It’s a steep price considering what a typical RMT might charge, but you can also enjoy the 40-foot relaxation pool where you can hear music when you dunk your head underwater. Other features include a sun deck, whirlpool, lockers, change rooms, and steam rooms. The 65-foot infinity pool at the Trump Tower in the downtown core isn’t open to the public, but if you pay for spa services access to it is included. The Trump Presidency notwithstanding, the pool and spa services here are as ritzy as they come. They operate under the philosophy of “everything beauty under one roof,” and includes whirlpools, saltwater pools, massage, skin treatments, and a full range of salon services. You don’t need to be a hotel guest to use the pool and fitness facilities at the Westin Harbour Castle on Queen’s Quay. Pay $100 a month for a membership, or $80 a month on a one-year contract, and enjoy the indoor pool and exclusive gym facilities. Bring your tennis shoes and take advantage of the squash or basketball courts while you’re there, then relax in a steamy sauna. You can even hire a personal trainer, or take swimming lessons here, for a fee.